If four kids are sharing 8 cookies equally, each kid gets two cookies. But what if four friends are sharing 3 cookies equally? How much cookie does each kid get? To represent parts of whole numbers, we use fractions. So if 4 kids are sharing 3 cookies, what happens? First, we divide one cookie into four equal parts, and give one part to each kid. Then we do the same with the second cookie, and then with the third one. In the end, each kid will have three pieces. Each piece is a whole cookie divided into four equal parts. The numerator is the number on the top, and shows you how many parts of the whole you have. The bottom number is called the denominator. It shows how many equal parts the whole is divided into. The whole circle is divided into five equal pieces, and two of them are shaded. 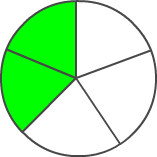 Represent the shaded part of the circle as a fraction. Two out of five pieces are shaded. Can fractions also be bigger than 1 ?? is bigger than one. Why? Well, if each piece is one-third of a sandwich, three pieces together will be an entire sandwich! But the kids have 8 pieces. So that's one whole sandwich plus five more pieces. In fact, it's equal to two whole sandwiches plus 2 more pieces. Remember !!! Each sandwich was cut into 3 equal parts. If the numerator is bigger than the denominator, the fraction is bigger than 1. Write a fraction that tells how many of the cars are blue. 1 is the numerator because it tells how many cars are blue, and 5 is the denominator because it tells how many total cars there are. Write a fraction that tells how many of the keys are yellow. 2 is the numerator because it tells how many keys are yellow, and 3 is the denominator because it tells how many total keys there are. In Olivia's family, there are 2 boys and 3 girls. Write a fraction that tells how many of the children are boys. 2 + 3 = 5 , so there are 5 kids total. That means 2 out of 5 children are boys. 2 is the numerator because it tells how many of the children are boys, and 5 is the denominator because it tells how many total children there are.